When it comes to designing a worthwhile website, the choice of content management system (CMS) may not be readily apparent. Complicating this choice are the almost-tribal sentiments of each system’s loyalists, each convinced of the “rightness” of their favorite. But both are open source, free to use, and provide a multitude of plug-ins and modules. So which is the real winner of a Drupal vs WordPress standoff? Drupal 8 just saw release, but it’s definitely not for everyone. Based on our experience, the go-to for nearly one-third of all websites is WordPress. It dominates 60% of the CMS market. Why deviate? To find the answer, let’s toss Drupal 8 and WordPress into a cage and see who comes out on top! WordPress is known for its 5-minute install and for low barrier-to-entry. Many newbies cut their teeth on WordPress and end up with an adequate and reasonably fast, if not glamorous, website. As noted below, themes are plentiful and can easily turn a plain-Jane sight into something you’d be proud to show the public. To get there with Drupal, you’ll need the skills of a developer. What Drupal lacks in simplicity, it makes up for in power and flexibility, but this is a deal-breaker for people that just want to publish a blog or make a small, functional website for their fledgling business. The awesome thing about WordPress is the sheer number of plug-ins and themes, and the relative ease of deploying them. Many are free, though not all are created equal, and paying for premium items can yield better support and overall product. For example, WooCommerce is free and gives limited eCommerce capabilities to WordPress, but expect to dip into your wallet if you want to add features or payment types. For brevity, we’ll extend the definition of “plug-ins” to include what Drupal calls “modules.” Drupal has plenty of options for plug-ins and themes, though nowhere near as many as WordPress, and you’ll once again need the “D” word to properly make use of them. WordPress doesn’t have a great reputation for security. Its popularity makes it an attractive target for prospective attackers, as does its status as an amateur-friendly CMS. Furthermore, while WordPress is quick to respond to security threats, the same cannot be said from many of the same plug-ins that make it so popular. The more you add, the greater the threat becomes, as each plug-in serves as a possible vector for attack. Is it possible to maintain a secure WordPress site? Absolutely. It starts by choosing an experienced web host (*cough* we might know one *cough* *cough*), and finishes by you taking steps to stay current on each and every theme and plug-in on your site. As long as you’re running Drupal 7 or later, you’re as safe as New York State, the Government of Australia, whitehouse.gov, Twitter, eBay, and NASA, all of whom use Drupal. This should not be interpreted to mean that Drupal sites are immune to security threats. Rather, the smaller number of poorly-coded plug-ins and themes, combined with the more developer-centric requirements, make it less vulnerable to Internet villany. WordPress was born as a blogging platform. It tends to be best suited for websites presenting most of their information within articles, as opposed to albums of interconnected information. Time and the devoted efforts of the open source community have diversified it considerably, although you’ll need to rely on plug-ins to broaden its functionality. Drupal can do anything. We advise against choosing it as your blogging platform, but if you have developer know-how or the resources to hire one, the potential is virtually limitless. Drupal is also innately mobile-friendly and has stronger core support for multilingual content. Finally. WordPress plug-ins themselves tend to be “plug-and-play” solutions, while Drupal plug-ins offer richer customization capabilities. WordPress was designed with simplicity in mind, allowing for easy and swift editorial collaboration among a handful of team members. This is great for blogging, but won’t offer enough granularity for any enterprise requiring a team with numerous roles and permissions. This can be extended with a plug-in, of course, but that’s another one to find, watch for vulnerabilities, possibly even pay for. With a built-in access control system that allows fine-tuned control, Drupal is the clear winner here. You can create custom roles, set multiple levels of user permissions with different degrees of access, and grant multiple roles to a single user. Even if such granularity doesn’t appeal to you now, it gives you scalability if and when your team grows. Both WordPress and Drupal have eager and knowledgeable online communities that love nothing better than to bring others into the fold. You’ll find no shortage of online tutorials and documentation for either platform. That said, if you’re looking for developer support — optional for WordPress but practically mandatory for Drupal — you’ll pay more for the latter than the former. This is simple supply and demand, as WordPress developers vastly outnumber their Drupal brethren. 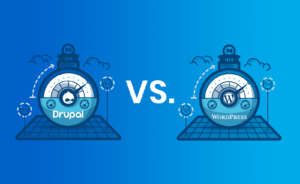 Drupal vs WordPress: Who’s the Winner? We know, we know! We don’t like ties, either. Looks like you’ll have to play judge and cast the deciding vote for who has earned the right to build your site. If it helps, we’re happy to help you host WordPress or Drupal, and we’ll keep any “tribal sentiments” to ourselves.